wires n doors, originally uploaded by amulya. I feel a little lost these days without my slr. I love my lil phone. brilliant quality. But i miss the bringing the camera upto your eye and getting the bird's eye view of what you want to capture. 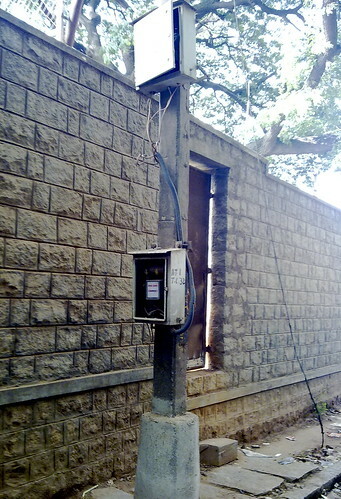 The door, the pole and the meter was what caught my attention. Hell... I probably wouldn't have had time to experiment there in the traffic either... which is why most photos are still on my trusty N79.